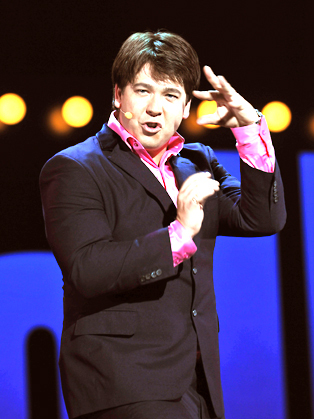 Michael McIntyre is arguably one of the biggest stars of British comedy currently performing. Ask anyone on the street to name a stand-up comedian and chances are 8 out of 10 people would first think of Michael McIntyre. Arguably the UK's most successful stand-up comedian of the last few years, Michael McIntyre has catapulted himself to super-stardom. Host of his own Comedy Roadshow, holder of the UK record for fastest-selling arena tour, and now a Britain's Got Talent judge, Michael is certainly in demand. From hosting the Royal Variety Show to numerous panel show and guest appearances, Michael has become one of the most familiar comedians on television. As confident as he is quick-witted, Michael is a boyish, likeable chap who improvises as effortlessly as Eddie Izzard and Ross Noble except with an additional knack for characters and accents. No comedian makes his job look easier. With stocks plummeting, if you want a sound investment, put your money on Michael McIntyre. In his smart suit and electrified floppy hair-do this sublime stand-up might resemble a city whizz-kid but he is the most bankable banter merchant on the block. He does classic observational comedy of social embarrassment better than anyone, whether it is exploring the protocol of kissing, dissecting the etiquette of exchanging phone numbers or revealing what happens when two limp handshakes collide. He turns everyday encounters into masterclasses of anthropological exasperation. Why do we only ever put vegetables in sandwiches at Christmas? Longer riffs show he can build momentum. There is a wonderful skit about "man draws", storage spaces filled with batteries, bulbs and other unfeminine flotsam. Even when he tackles things that umpteen comedians have tackled before, he does it so well it feels box-fresh. For McIntyre the arcane shopping-then-queuing process in Argos conjures up an image of "theatre for the poor". Michael McIntyre generates most of his material by chatting to the audience. As confident as he is quick-witted, Mcintyre is a boyish, likeable chap who improvises as effortlessly as Eddie Izzard and Ross Noble except with an additional knack for characters and accents. No comedian makes his job look easier. Any producers who are looking for a new TV Presenter should go to his show and bring their chequebooks.